Welcome! We are located in Kansas. Our dogs are a part of our family and live inside of our home, and are given tons of love!! Our utmost priority is to support the breed, and to enjoy our dogs as family and we do so at all times. Please browse our pages and meet our dogs. We are very proud of them. We will be updating educational links regularly. I bet you thought this was another photo of my OFRN "Max". Well, this dog is also named Max, but he was an OFRN who almost lost his life in a shelter. He was minutes away from death before he was rescued! We found out was just another statistic and these dogs end up in the shelter all the time. 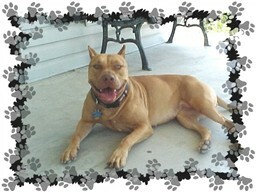 Maximus and all the others out there like him are why we no longer breed Pit Bulls. We have chosen to no longer breed the APBT- Due to the fact that there are so many Pit Bulls out there in need of homes, we feel it is not our place to bring more into the world. Please consider a shelter pet as an addition to your family. There are so very many in need. Litteraly hundreds of Pit Bulls are put down everyday because of the lack of homes. Please do your part in supporting this incredible breed and DO NOT support backyard breeders. The APBT is facing a loosing battle, and it is up to all of us through responsible ownership and education to save them. 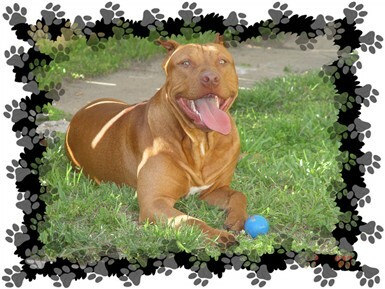 Our goal is to educatate people on the true characteristics of the American Pit Bull Terrier. We have chosen to own this amazing breed because of our utmost respect for it. 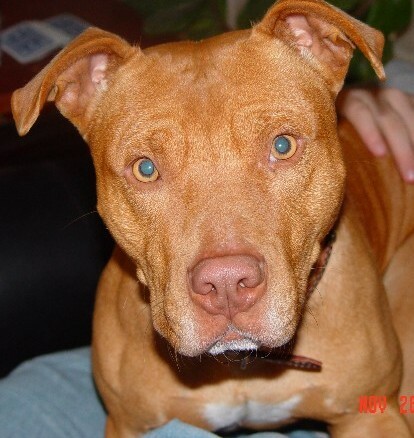 It is NOT a breed for everyone, and the decision to add a pit bull to your family is NOT one to take lightly. A Pit Bull strives to make their owner's happy and proud. They deserve an owner who is determined to always put their best interest first, and be a responsible pet owner. When you adopt a Pit Bull in need you save not only one life, but two. For you open up a space for a Pit Bull waiting to be saved. When you buy from a breeder you not only took a home from a Rescue in desperate need, but from a Pit Bull waiting to be saved as well. The Pit Bull waiting, will probably not get a second chance. He will cross the bridge never knowing his forever home. Please ADOPT, FOSTER, SPONSOR OR DONATE to a Pit Bull Rescue in your area Today! Visit Mid-America Bully Breed Rescue and find out how. It WILL make a difference ONE Pit Bull at a time!